Lagos State Governor, Mr Akinwunmi Ambode on Monday paid glowing tributes to the late winner of June 12, 1993 Presidential Election, Chief M.K.O Abiola and other martyrs of democracy who laid down their lives in the struggle to entrench good governance in the country, urging Nigerians to continue to remain united and uphold democratic values. The election, which was adjudged as the freest and fairest in the history of Nigeria, was annulled by the military junta. Speaking at a symposium put together by the State Government in conjunction with June 12 Coalition of Democratic Formations to mark the 24th anniversary of the annulled election, Governor Ambode said the day and the events that followed would remain evergreen in Nigeria’s political history, being a process through which Abiola and others laid down their lives in a bid to actualize the popular will of the people expressed through the ballot box. 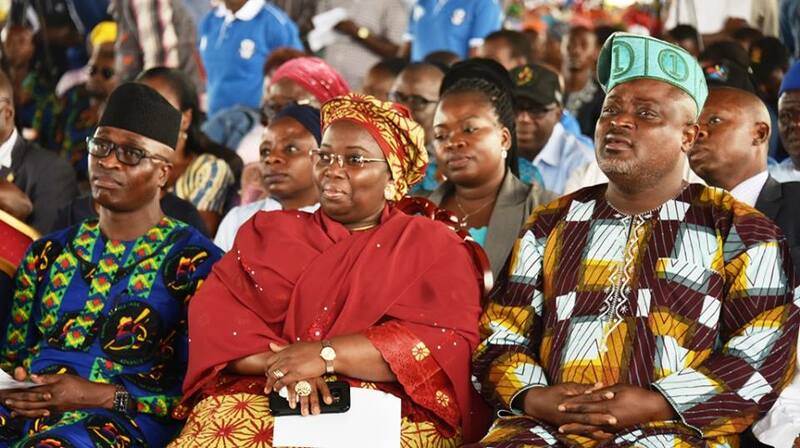 Governor Ambode, who was represented by the State’s Deputy Governor, Mrs Idiat Oluranti Adebule, said the seed of the 4th Republic currently being enjoyed was sown and watered by the blood of men and women who were cut down in their prime, adding that their memories would be honoured until the end of time. While acknowledging the fact that the June 12 struggle was waged not only by Abiola and members of his family but also pro-democracy groups particularly National Democratic Coalition (NADECO), students, trade unions and indeed all Nigerians, Governor Ambode said it was a thing of joy that by the collective efforts of government and people, Lagos State, over the years, has kept alive the yearnings and aspirations of the people expressed on June 12, 1993. He said: “It is an open fact that the successive democratically elected governments in the State since 1999 have been totally committed to democratic principles, rule of law, strengthening of democratic institutions as well as implementation of programmes and policies that would enhance the wellbeing of all Lagosians, without bias for tribe, religion, political belief or gender. “To strengthen the hope of the masses in the principles of democracy, our administration embraced ‘all-inclusive policy’ which was geared towards involving all segments of the populace in the governance process; avenues and institutions were created to enable all have a voice in the affairs of the State,” he said. Aside that, Governor Ambode said his administration also embraced Town Hall meeting approach to create avenue for numerous stakeholders and the people to air their opinions and suggest a way forward for the State, while wealth creation and job creation strategies were also adopted with focus on entrepreneurial activities to expose youths and the people to numerous skills to make them either employable or self-employed. Besides, Governor Ambode urged Nigerians to keep alive the principles of June 12 by upholding democratic values and culture especially by participating in democratic processes such as voters’ registration exercise, voting for candidates of choice during election and avoiding any act that could disrupt peaceful conduct of free, fair and credible election. Guest speaker at the symposium, Dr. Dele Ashiru from the University of Lagos, who spoke on the theme: “Development Strategy In Lagos: A Blueprint For National Development,” commended the leadership which the Lagos State has produced since 1999 till date. He said it was incontrovertible that former Governor Bola Ahmed Tinubu incubated the developmental agenda of the State and advanced by his successor, Babatunde Fashola, while the incumbent Governor, Mr Akinwunmi Ambode is expanding and consolidating the vision of development in a seamless, ingenious and brilliant manner. On his part, Chairman of the occasion and former Military Administrator of Lagos State, Rear Admiral Ndubuisi Kanu (Rtd.) said even though a thick cloud is hanging in the horizon on the state of the nation especially with agitations from all parts of the country, he was of the firm believe that the situation could still be salvaged through restructuring which would not be about re-inventing the will but returning to a federation of different peoples.